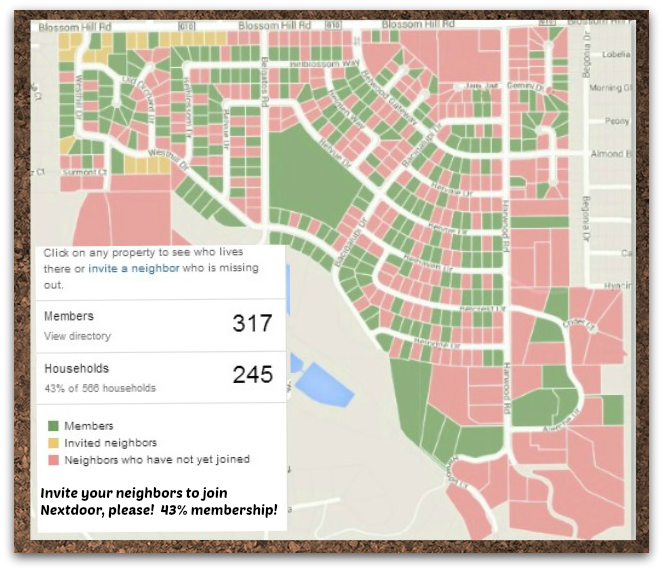 Update on the Nextdoor.com private intranet for neighbors in the Surmont-Belgatos-Belwood and beyond areas – We launched our site November 17th, 2011, and 2 months later, got up to 39 people (in 32 households). As of Nov 17, 2013, our 2 year anniversary, it was 317 members in 245 homes (see image at right). We are still growing and now have a roster of 321 neighbors (248 of 567 households) or 44% of households participating. Thank you to all who’ve been active in sharing news and inviting neighbors to join us! For those who aren’t onboard and are wondering, what is Nextdoor all about? This is a private, online social network site for neighbors sharing with neighbors things that matter to them. Often this includes issues and concerns that otherwise we wouldn’t know about, whether a problem (break ins, solicitors), a need (babysitters, gardeners, house cleaners), an alert (coyotes spotted, skunk problems) event or other positive happenings. Many times, this is almost like a virtual “neighborhood watch”. I do know that people worry about their information being public. The system requires members to be verified, either by mail (free) or by phone (which requires a one cent charge to a credit card). This is done to insure that everyone in this private site is actually a neighbor – for everyone’s protection. Also, you don’t have to share your email address or phone number, but of course you can if you choose. The Town of Los Gatos has embraced Nextdoor as a great way to facilitate communication and major town events are announced on this site also. On the fence? Log in, have a look and see what you think. There’s a lot to like about it! And for current members, PLEASE INVITE YOUR NEIGHBORS! You can do this for free by sending postcards! Just click on the “invite” button on the top right side. The system will allow you to mail a few cards each month at no cost. 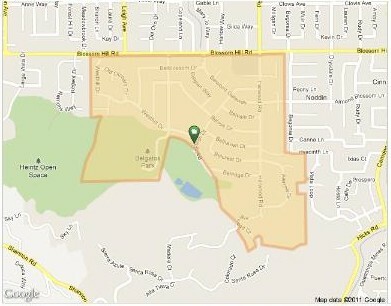 Finally, if you are not within these boundaries but are interested in Nextdoor for your area, just go to Nextdoor.com and input your address. You’ll find out right away if you are within an established neighborhood. If so, join! If not, perhaps you can begin one there yourself. It’s a great way to keep in touch.